Humvee TH400 to 700R4 Conversion Flexplate. Get 30 to 40% better mileage and 30% less RPM’s. SUBJECT: Proper installation of the throttle valve cable on Factory and after-market carburetors or fuel injections. This information applies to all 700R4, 4L60 and 200-4R transmissions. Throttle valve cable adjustment instructions, numbers 4, 5 and 6. #1. The button that the cable hooks to at the carburetor or throttle body must have approximately 1 and 3/32-inch radius from the center of the throttle shaft to the center of the button the cable hooks to. #2. Looking at the throttle shaft lever from the left side at idle position, approximately 33% of the throttle lever total travel must be to the rear of the throttle shaft centerline. And at wide-open throttle, approximately 67% to the front of the throttle shaft centerline. This will be about ½-inch to the rear and 1 inch to the front of the throttle shaft centerline. #3. The throttle valve cable must be hooked up in this manner so the pressure will rise faster off idle and slow down at heavy throttle. If the pressure cable is pulled in a more even manner the pressure will be too low at light throttle. Failure to hook-up the throttle cable in this way will burn the three-four clutch pack up fast. #4. 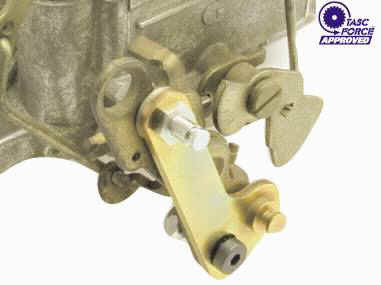 The throttle valve cable controls transmission pressure. Adjusting this cable is the most important step when installing a 700R4, 4L60 or 200-4R transmission. #5. The final step is to adjust the throttle valve cable. The cable must be adjusted so it is pulled fully out at wide-open throttle. To make sure disconnect the cable, hold the throttle wide open with your left hand, pull the cable fully out with your right hand and see if the cable end lines up with the button on the throttle lever. The cable should also be pulled out 3/8 to 1/2 of an inch at idle. #6. Do not attempt to adjust the shift timing with the throttle valve cable. The shift timing is controlled by the governor springs and weights. For higher shift points at wide-open throttle install lighter springs. For lower shift points at wide-open throttle install stronger springs. After the cable is adjusted the approximate shift points should be 15 to 18, 25 to 30 and 40 to 50 MPH at very light throttle depending on tire size and axle ratio. Light throttle shift points are measured in MPH and full throttle shift points are measured at what RPM. The full throttle 1-2 shift will usually be at a higher RPM than the 2-3 shift. The governor will work with only 1 spring or 2 springs. You can remove one spring to raise the full throttle shift points. #7. You can get a cable button off of a junk GM vehicle and weld it to your throttle valve lever. We sell a cable correction kit for Holley and Edelbrock carburetors. #8. Sometimes on a newly rebuilt 700R4 or 200-4R transmission, it may not make the 3-4 shift when first installed. A stuck valve, trash in the fluid or an air pocket, usually causes this. Raise the rear wheels off the ground, place the transmission in overdrive position. Run the speedometer as high as 100 miles per hour, pop the throttle on and off and see if you can force a 3-4 shift. Once it makes the first 3-4 shift, work the shift lever back and forth between drive and overdrive until the 3-4 shift works correctly. #9. If you have a Holley or Edelbrock carburetor, you must install an adapter on the carburetor linkage for the transmission to work correctly.